In April, 2011 Arrowhead Studios proposed two DLC packs and asked gamers to vote via facebook on which one to release for free and which one to charge for. After the results came in, the Cavern DLC was released for free and Marshlands lists on Steam for $1.99. Just like the Vietnam DLC, you don't need to own the DLC to play it, only the host needs it. This provides a good way to try it out before buying it. There is no story or objectives to complete in this expansion. Your goal is to survive waves of enemies that spawn in various locations. There are two challenges with twenty waves each. When I played with friends we survived about 12 rounds. The swamp environment is new and there are some new enemies as well. Some new enemies include chomping treasure chests and zombies. Many of the enemies from the main game are brought back in vicious hordes. Even Vlad the vampire stops by to try and kill you. Unsurprisingly, this game is still riddled with bugs and glitches. I still experienced a crash to desktop while I was hosting a game. The graphics are colorful and the swampy backdrop is a nice change of scenery. There's not much new when it comes to the music or voice acting. 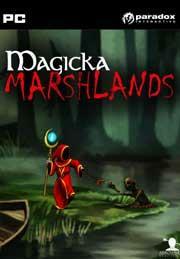 For $1.99, Magicka Marshlands doesn't offer much other than a new survival mode and scenery. If you were happy with the Caverns addition you'll definitely enjoy this. If you don't like the survival mode, you may want to pass this DLC up.